JNN 29 Oct 2014 KARACHI: A nine-month-old Baby girl lost her life while eight others, including six women, were injured when a hand grenade was lobbed at the Islamic Research Centre (IRC) at Ayesha Manzil, Karachi on Tuesday evening. Initial reports suggested that assailants Of Banned Takfiri Organizations riding on a motorcycle lobbed a grenade from the Ayesha Manzil flyover which overlooks the IRC and the adjoining Imambargah, before fleeing. The grenade exploded near the gate of the Imambargah as a congregation ended, injuring nine people including women and a child. 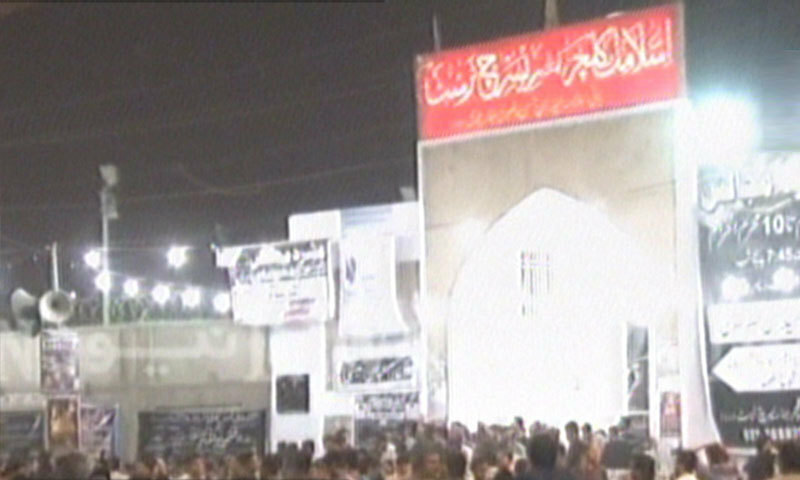 Witnesses said that a flock of women were gathered near the gate of the Imambargah when incident occurred. The victims were shifted to different hospitals including Abbasi Shaheed Hospital and Aga Khan University Hospital for treatment. Jafria Alliance Pakistan , Spokesperson Salman Mujtaba declared that a nine-month-old girl – who had arrived with her parents to attend the Majlis – had succumbed to her injuries during treatment at AKUH. Experts from the bomb disposal squad along with a heavy contingent of police and Rangers reached the site soon after the incident. Officials said that the explosion was caused by a Russian-made hand grenade. Gulberg DSP Ahmed Nawaz said that the attackers wanted to target participants of the Muharram congregation and they had hurled bomb from the adjoining flyover. He added that a long steel sheet had been placed on the side of the bridge as a safety mechanism and a permanent police mobile has also been deployed on the bridge for security. Following the blast, charged mob gathered on the Shahrah-e-Pakistan burnt tyers and blocked the road for traffic. Protesters chanted slogans against the SSP , LeJ and other Terrorist Groups and demanded a Major Crack down against the Terrorist Groups Operating across Pakistan By law enforcement agencies. Jafria Alliance Pakistan , Majlis-e-Wahdat-ul-Muslimeen and other Shia Parties and Notables Deeply condemned the incident and demanded an Army Operation against the Terror groups Operating in Karachi and Other Parts of Pakistan and demanded a Fool Proof Security in the coming Muharram Days , when Hundred of Procession and Religious Events will be Organised by the Muslims of Pakistan , and especially the Shia Community, across Pakistan . This entry was posted in Asia Pacific, Jafria, Pakistan News and tagged Ayesha Manzil, Baby Batool, grenade attack, Hand grenade, Imambargah, IRC, Islamic Research Center, Islamic Research Centre, Karachi. Bookmark the permalink.